You Call 50,000 Palm Pres Sold A Success? Investors Don't Think So. Some early estimates are in on how the Palm Pre did its launch weekend. J.P. Morgan puts sales at more than 50,000, other analysts go as high as 100,000. Everyone is trying to spin this as a success because Sprint stores “sold out” of their inventory. Investors aren’t buying the story. 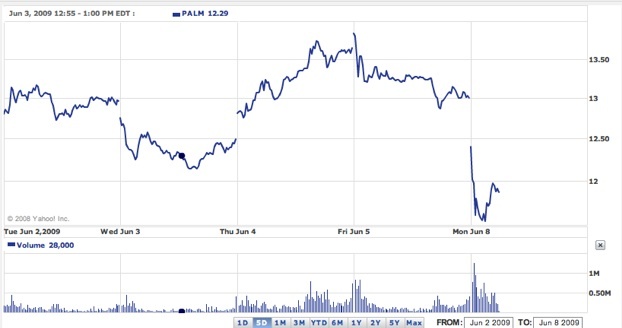 Shares of Palm are down 10 percent, as of this writing. The opening weekend Palm Pre inventory was too low to begin with—either because of manufacturing constraints, Palm’s own financial constraints, or by design. It’s always good PR to be able to say you sold out. But if Palm seriously wants to go up against the iPhone it is going to have to do a lot better. When the first-generation iPhone launched two years ago, in comparison, Apple sold 146,000 units its first weekend. By the time Apple came out with its second iPhone 3G last year, it sold one million units the first weekend. Apple has been prepping the market for the past two years, spending millions on convincing everyone that they need a Web phone. Palm and others should be able to tap into all of that good feeling during this Summer of Smartphone Love. If Palm and Sprint don’t get their act together, there won’t be much love left for them. If the experience described by iJustine in the video below is any indication (she couldn’t even find a working Palm Pre at either Best Buy or a Sprint store to try out before buying), the low-inventory excuse is already wearing thin with consumers.